CALGARY – Alberta oil sands production will grow by nearly one million b/d by 2025, according to a new forecast from consultancy IHS. IHS expects continued oil sands production growth through the period, with oil sands growth entering a new phase driven primarily by the expansion of existing facilities with more attractive economics. Oil sands production is forecast to grow at a significant pace that, though lower than historical levels, will keep Canada among the largest sources of global oil supply growth. Canada is part of the “G-5+2”—a group of low-cost Middle East oil-producing countries (the Gulf-5) plus the United States and Canada. Collectively, they will account for most of the world’s oil supply growth. Construction of projects that started before the fall in oil prices (and where significant capital has already been invested) will be complete by 2018, after which construction activity could cease. The subsequent completion and then ramp up of these facilities will drive growth to 2020. “We expect oil sands producers to focus future investments in the coming years onto their most economic projects—which we expect to be expansions of existing facilities,” said Kevin Birn, director for IHS Energy, who heads the IHS Oil Sands Dialogue. “Expansions of existing facilities are better understood, quicker to first oil and lower cost to construct. It is less risk at a lower cost. Click here to see Quantum’s new patented wellbore clean out technology now available in Permian Basin. Experience production increase, fewer future interventions, and no formation damage. Available in Alberta and Texas. IHS expects growth to continue, with the substantial majority—more than 75 per cent—of future activity coming from the expansion of existing facilities. Over three quarters of future activity is expected to be underpinned by such expansions. “As we saw with tight oil producers, when prices collapsed, they focused their activity on the most productive areas,” said Birn. An additional factor supporting future oil sands growth is the lack of production declines from existing oil sands projects, says Birn. 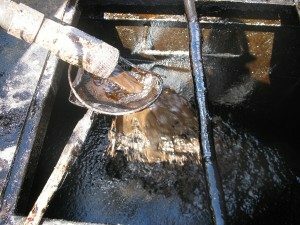 If facilities are maintained, their production levels do not decline, which is unique compared to other types of oil production globally. This means that each investment in new oil production results in net growth. 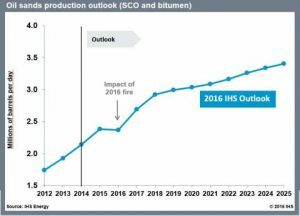 1 Comment on "IHS oil sands production forecast: Growth of 1 million b/d 2016 to 2025"